Microsoft just bought the social media platform LinkedIn for US$26.2 billion in cash. Not a bad way to jump start an emerging social media company’s march toward user numbers, and revenues. This ASX stock is attempting to solve one of the biggest problems for avid social media users. This means choosing between Facebook, Twitter, Snapchat or the many other platforms that now want a piece of your life story and are urging you to connect with others. 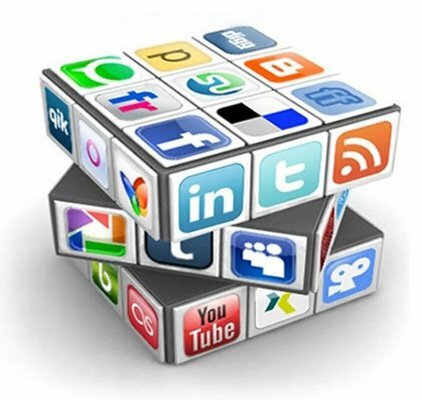 These days, there are more than 140 social media platforms catering for different styles, formats, languages and age groups. When you break down the numbers of who is using what, you gain a sense of how disparate social media can be: Facebook has 1.49 billion monthly active users, WhatsApp 1 billion users, Twitter 302 million and the list goes on. Thus fragmentation has occurred – creating barriers to communication and what’s more, most social media has evolved to become a broadcast network rather than a communication tool. The irritation for users is only now surfacing, as people realise that their own personal choice of platform may not be the same choice amongst their friends, or work colleagues. The result is that people are unable to connect with each other seamlessly, or worse, are left no choice but to download dozens of apps just to be able to touch base with friends. This indomitable online revolution needs a universal key that can unlock the walls built up around individual social media channels and platforms. One company that listed on the ASX today proposes to provide that key. And as we indicated above, it is backed by the $395BN software giant Microsoft. Of course, this company is still very much in its infancy, so like all speculative tech stocks, apply caution to any investment decision made with regard to it. 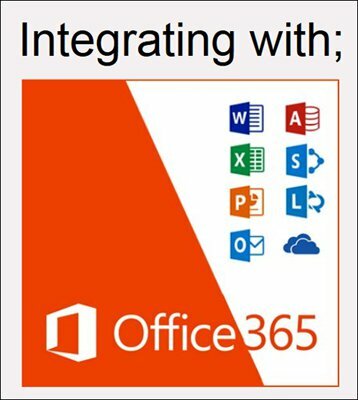 Office 365 users will be introduced to our company’s platform functionality when they use their word-processing, charting and presentation functions. What this company will effectively resolve, is the bugbear of having to check and update dozens of social media applications spread out across mobile phones, tablets and PCs. It intends to provide a one-stop shop for all communication including text messages, emails, PMs, and social media posts. If you could still ‘poke’ on Facebook, this company’s technology would allow you to do so via any platform on any device — not just on Facebook with your Facebook buddies. The state of play in social media is that users feel swamped, and yet, the need to communicate and interact remains (and growing). Thred (ASX:THD), proposes to come in and make the amount of applications you install a mere redundancy that need not cause any angst for users. Thred has come to list on the ASX following a reverse take-over of Peruvian minerals explorer Promesa. Thred traded under the code PRA initially, and has now changed to THD. Prior to relisting, the company raised over $6.3MN through an oversubscribed public offer, issuing 127,020,235 shares at $0.05 per share. Given the recent news on Microsoft’s LinkedIn acquisition, this may also give Thred a rapid entry point to the billions of users that keep coming back to LinkedIn. Let us look at the nitty-gritty behind Thred, to see whether this tech innovator has a chance of bridging users. First things first, Thred is not trying to compete with the existing powerhouses of the social media app world. The name of the game is not to convince everyone to abandon their existing app installations and move over to Thred. To the contrary, Thred wants to be a supplementary force for the huge spectrum of social media apps available. 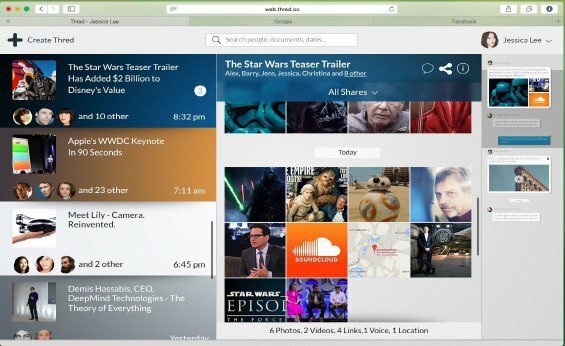 Its technology allows for a cohesive and seamless experience whereby the user only sees one centralised hub from where they can quarterback their messages, social media posts etc. to whichever friend they like, without even thinking what list of apps that friend has. Currently, without Thred’s technology, you would have to install more apps and have no choice but to have them all running. In no uncertain terms, Thred unifies social media engagement and thereby helps to accelerate it because people are allowed to refocus on compelling content creation, rather than haphazard app selection. For any newly created tech company, early sales and revenue is paramount. Thred plans to generate cash in two distinct ways in the hope of raising its valuation from its current market cap. In an effort to generate strong revenues over the mid-long term, Thred will rely on 3 rd party sales of various goods and services offered to users. The thinking is that targeted advertising will be able to attract higher ad spend per user, as well as reaching internationally for previously untapped foreign customers in places like China where social media usage is completely different to that of the West. Any new tech start-up with glitzy and innovative ideas must find a way to tell the world about it. There are many good and effective ideas, but if no one knows about it, the idea can often die a premature death to be commercialised by someone else. 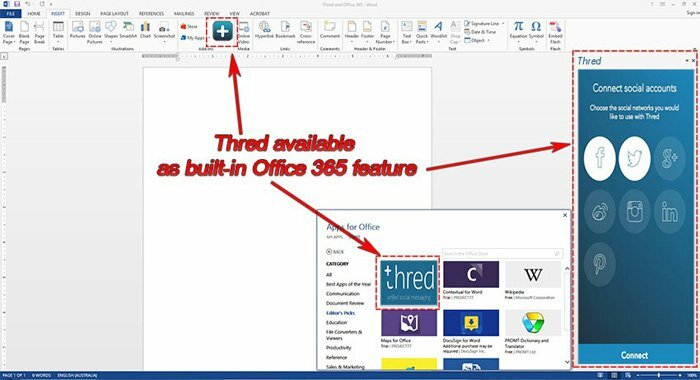 To ensure its platform sees the light of day (and hopefully, the inside of consumers’ wallets), Thred has stitched together a masterstroke deal with Microsoft that will see its interface built in to the Office 365 software package as standard. Once the development is completed, it is anticipated that every single Office 365 user will be stumbling upon Thred’s functionality as part of their word-processing, charting and presentation duties. Microsoft will be providing Thred with financial and technical support to integrate it with the Microsoft Azure Platform, while Thred will also have access to Microsoft Office 365 data, including Mail, Calendars and Contacts. Microsoft’s Office 365 has 60 millions users globally, which means Thred will be addressing this huge audience with its functionality and appeal. If all goes well, Thred will start picking up users very quickly because its app is free at the point of service yet very valuable to users because of its functionality. 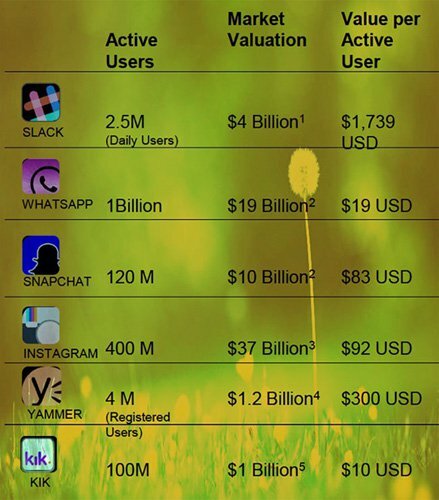 Apps like Slack, WhatsApp and Snapchat, were all launched less than 5 years ago — and yet, have managed to establish valuations of US$4BN, US$19BN and US$10BN respectively. For Thred to achieve a huge valuation, it will first have to assemble a user base somewhere in the millions. So before getting carried away with excitement, bear in mind that investing in early stage, small tech stocks like Thred do entail risk, and there is no guarantee that the company will reach this level of success – so apply caution to your investment decision. The good news is that Thred is offering a free app that in effect works on a ‘freemium’ business model. Thred is compensated only when a user pays for a sponsored ad that was displayed whilst using the app. 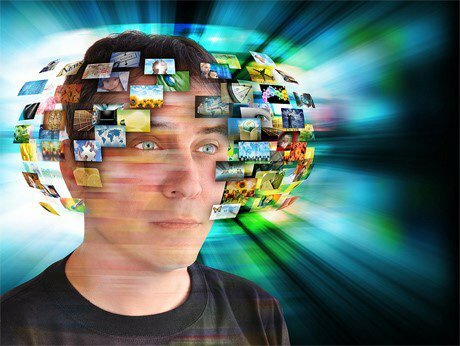 As you can imagine, the ads being streamed to users are customised as much as possible to suit the individual based on cookies, metadata and other digital crumbs left behind by the user. This is more or less how Google earns its revenues — by offering a quality web search service for free, and then charging relatively small fees on a rolling basis. The insatiable growth of online connectivity eventually led to social media sprouting like wildfire. For a detailed history of social media, we would recommend the following . From a pure numbers perspective, take a look at these statistics analysing social media participation since the early 2000s. 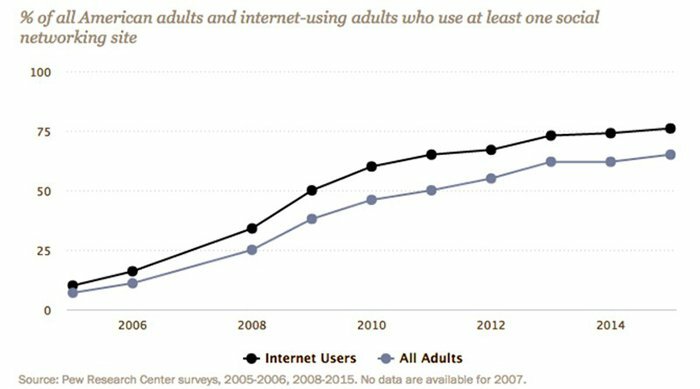 From almost zero social media participation prior to 2006, we are now seeing around 75% of all US adults using social media. A bit of a boom if you ask us here at The Next Tech Stock . 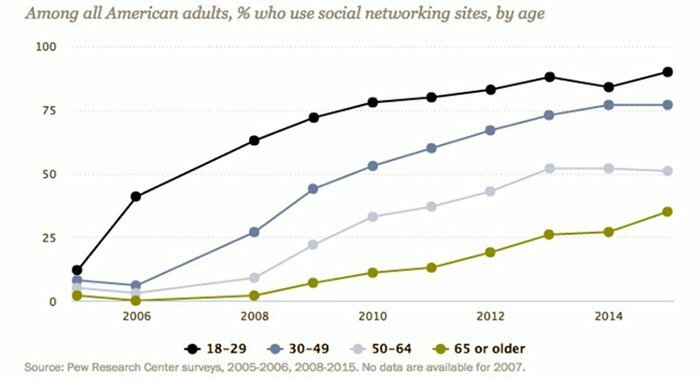 And if we have a gander at exactly who is driving social media use, it’s clear that the younger you are, the more likely you are to use social media (although this is gradually changing as social media use becomes more accessible for the older generation). As you can see, it’s the 18-29 young’uns that rule the roost when it comes to social media participation. As more users flock to using social media, there has been a natural tendency for new apps to come onto the scene and effectively splinter users into hundreds of small pockets, dotted around the digital landscape. As an example, if you want to post or view a video — you will need to sign-up to, and operate the YouTube app. If you want to find a job — you will need to sign-up to, and operate the LinkedIn app. If you want to interact purely with images that displayed for 10 seconds or less — install the Snapchat app. If you want to connect on a personal level — Facebook. If you want to broadcast a bit of news — Twitter. The wonderful world of App Development is seemingly running into novel new applications and at a breakneck pace — but forgetting to take the average user with it. 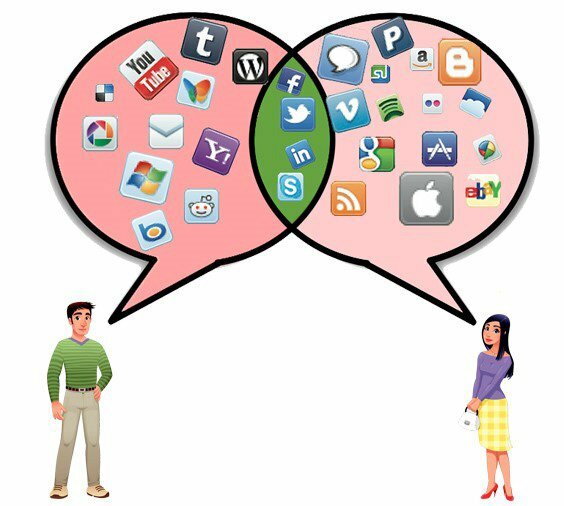 Two people looking to communicate with each other will only be able to do so if they have the same apps installed (and running). Unless they both have Thred. You can see the problem as the amount of apps has grown from a handful to more than 140 in just a few years — you simply cannot install and keep track of dozens of apps without going a bit bandy. Users are looking for something that will solve this mess, and already aggregator apps such as WhatsApp have appeared, but they do not go far enough in solving the core problem of a lack of inter-app connectivity. Thred’s bridge could solve the core problem. ...but there is an additional bonus to be had if Thred is able to bridge the linguistic and cultural divides separating East from West, as well as societal divisions based on race and ethnicity. 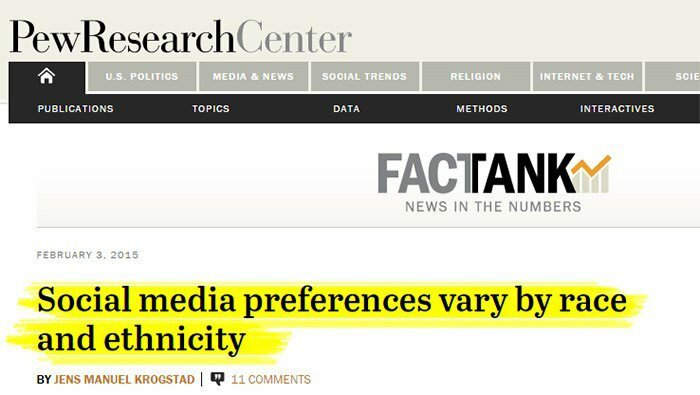 According to market research done by Pew Research Center, there is a clear disparity in social media preferences between different races and creeds. 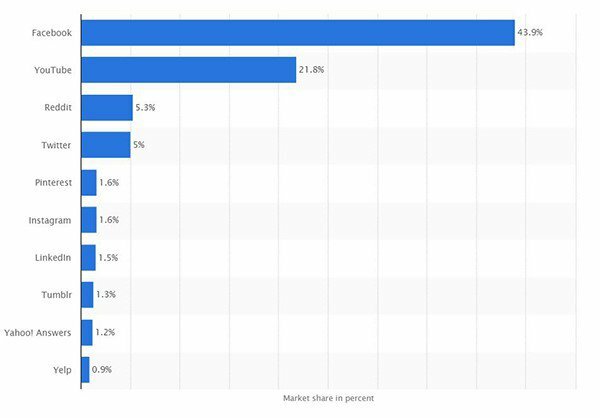 ...not one social media platform is in both the top 10 in the US and the top 10 in China. This effectively means there is a huge opportunity for Thred to play peacemaker and bring the two sides together (without installing or uninstalling any apps we might add). The Western front-runners are being led by Facebook and YouTube, accounting for over 65% of all social media traffic when combined. Meanwhile, over in China, the social media stampede involves 10 completely different social media platforms. Here are those stats charted, to give you a better sense of the contrast. 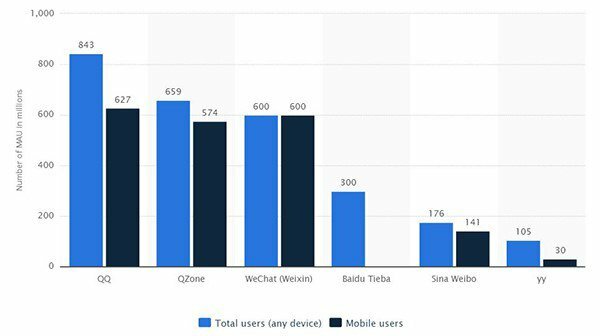 The Chinese seem to be rather unimpressed with Western primetime social media platforms, such as Facebook or Twitter or LinkedIn, instead preferring their own domestic variants, namely QQ, followed by Qzone, WeChat, Baidu, Sina and YY. This perfectly exemplifies the issue Thred could directly solve. 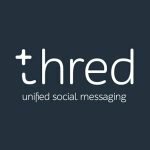 With Thred, Asian and Western users, can for the first time interact on social media in a truly cohesive and unified way — and en masse. 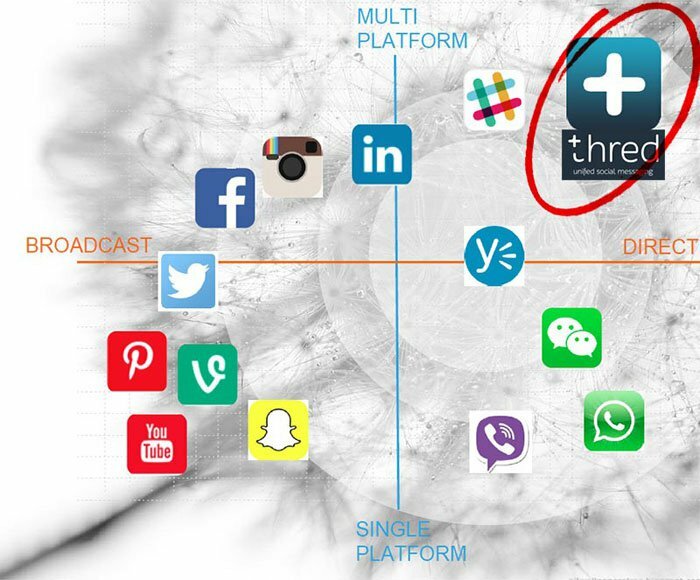 Thred is a direct multi-platform service application that outshines most of the social media big guns which could mean strong market traction. With the world jumping two feet first into social media — a systemic problem has arisen which Thred intends to solve. 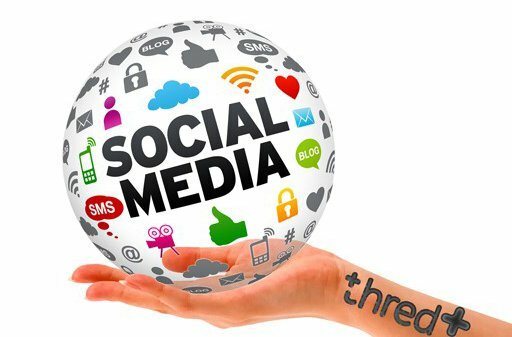 The technology Thred has developed effectively wipes the slate clean for existing social media power users, and simplifies the whole user experience for newcomers. Using a freemium model to drive brand recognition and initial take-up, gives us confidence Thred will eventually achieve a substantial user base with which to create strong commercial performance. It will be helped by its partnership with Microsoft which puts its platform in front of all Office 365 users – that’s at least 60 million commercial customers right there. Again, this is an early stage tech play, so professional advice is recommended if considering an investment this stock. 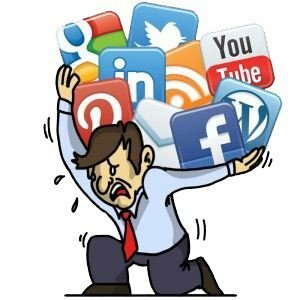 Thred does not compete with the likes of Facebook, Twitter or LinkedIn — it wraps itself around all of them like a warm blanket on a cold winter’s day to give their users that warm-and-fuzzy feeling from knowing all their social media operations have now been decisively optimised.